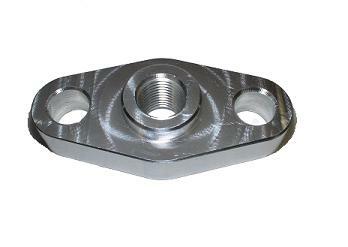 Billet aluminum oil feed flange with threaded 1/8" NPT port. Intended for compatible turbochargers without a threaded oil feed port. 1.5" bolt center to bolt center spacing. Requires oil feed flange gasket and two 8mm thread x 1.25 pitch fasteners to install and fasten the oil feed flange to the turbo.